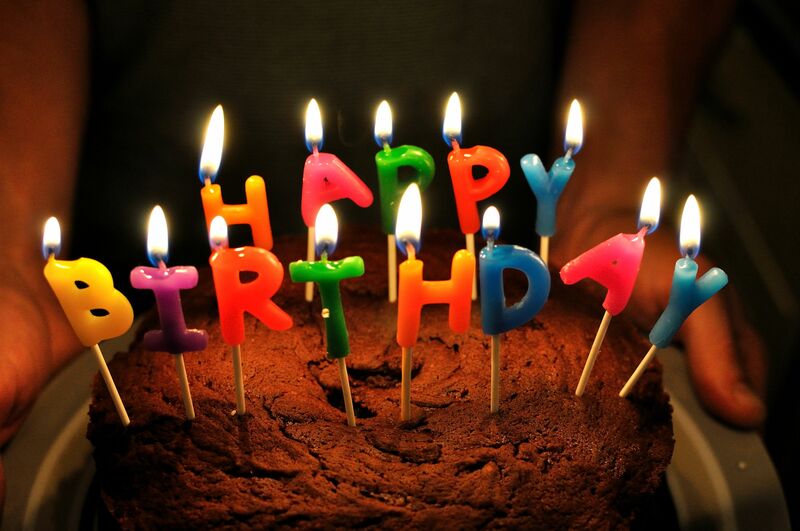 Happy 1st Birthday Comet Hunters! Today marks one full year of Comet Hunters. It’s amazing how time flies while you’re having fun and exploring the Solar System! Thank you for all of your time and contributions. We really appreciate it. We couldn’t do this without the Comet Hunters volunteer community. Over this year, the science team has been developing the analysis pipeline to combine the multiple classifications of each subject together. We’ve also reviewed possible comet candidates and also launched the Hyper Suprime-Cam search. In Year 2, we’ll work towards the project’s first science papers. I’ll be marking Comet Hunters’ birthday by sitting down in a coffee shop and writing some text about how the Comet Hunters website works for the start of our first science paper draft. Stay tuned to this space in the future for more paper and progress updates. Starting today you might see some new things popping up on Comet Hunters. These new features and surveys have been developed by the Zooniverse that may one day end up on all future new Zooniverse projects. The Comet Hunters community was selected to help to try these features out. During the next four weeks, selected Comet Hunters volunteers will receive an invitation to participate as you are classifying images in the HSC search workflow. If you just want to get on with the comet search, not to worry. You can opt out of participating or check out the Archival search which is exactly the same as before. Thanks in advance for your help. Your feedback and interactions will help the Zooniverse to improve the current set of web tools and build better future Zooniverse projects. We’ve recently uploaded brand new images on both the HSC workflow and the Archival Workflow. The Archival images are still from Suprime-Cam and continuing to move backward in time. These observations will help us understand the true frequency of main-belt comets. Any good candidates we’ll follow-up when the asteroids return to the same spot in their orbit as when the observation was taken to see if the activity repeats. We’ve now uploaded June HSC observations on to the HSC workflow. These images are hot off the telescope, giving us a chance to follow-up these asteroids now if they are active. Both sets of images are of brand new asteroids never viewed before on the site with new chances to discover a main-belt comet. You might be the first person to know a new comet is lurking in our Solar System’s asteroid belt. Search for main-belt comets today at http://www.comethunters.org! Ishan has spent the last two months as an ASIAA summer student with Comet Hunters working on making simulated images of main-belt comets. Ishan has chronciled his progress here and here on the blog. The goal is that with this simulated main-belt comets we can learn about how faint of cometary activity can the project see. This will let us probe the frequencies of main-belt comets in ways we couldn’t do with just the HSC data alone. Thanks Ishan for all your hard work and effort this summer. As you can see in this graphic, most of the comets reside in the Kuiper belt beyond the orbit of Neptune and in the Oort Cloud in the outer solar system. The also differ in size and composition. While comets typically range from 6 – 25 miles in diameter, asteroids are much larger with their diameters ranging from the size of small rocks to about 600 miles. So what are Main-Belt Comets? These are a recently discovered class of main belt objects which show cometary activity. Here’s an image of a main belt comet taken by the Subaru Telescope. Here we see images of the first six MBCs discovered. The plot on the right clearly shows that these objects are distinct from comets while being indistinguishable from asteroids. So why are we interested in MBCs? Firstly, our classic difference between asteroids and comets based on their composition is called into question. Asteroids were never known to have volatiles present in them. The astrobiological implication: Origin of water on Earth. This interests me the most! The Earth is believed to have formed dry owing to its location inside the snow line, and therefore the water we see today must have been delivered from outside the snow line, perhaps by impacting asteroids and comets. There are models which suggest that water delivery from asteroid belt was more likely. MBCS provide us a way to test this. The search efforts so far have been mainly of two kinds: Using computer based pattern recognition algorithms and using human pattern recognition abilities. Computer algorithms currently are not faring well because of the very low SNR of the coma/tail region. They are also unable to accurately account for the whole range of tail morphologies. Hence, there are a lot of false positives. The image quality is not good as its a small telescope. In fast, most surveys use a small telescope. Since the search is conducted by eye and the team consists of just a few scientists, the process is very slow and laborious. Here’s where Comet Hunters comes in as a possible savior. So, Comet Hunters is a Citizen Science project under the citizen science web portal called Zooniverse. The idea behind citizen science is crowdsourced scientific research, ie, a large number of volunteers, their numbers usually in thousands, actively participating to complete research tasks. Projects at Zooniverse span Astronomy, Climate Science, Biology, Physics and even Humanities. Galaxy Zoo is a famous example of astronomy related. The volunteers are shown images of galaxies and they have to classify them according to their morphologies. Another is Planet Hunters, where you need to spot dips in light curves corresponding to planet transition. In Comet Hunters, volunteers are shown images of asteroids and they need to check for the presence of a coma or a tail. A candidate is vetted by the research team only when about 20 volunteers spot any activity. The combined assessments of so many people are much more reliable than individual opinions. So we have a large number of searchers now. What about the data? The data for Comet Hunters comes from Subaru, an 8 m telescope at Mauna Kea, Hawaii. Large telescopes are rarely used for surveys. So we have a large amount of high quality data. Two catalogs: Suprime Cam Archive and the Hyper Suprime Cam current survey data. So we have 17 years worth of data. Easier to spot recurrent activity. Here’s a just a quick example of an image shown on the Comet Hunters website. It can be also be seen with inverted colors for more clarity. The two images are about 20 arcsec in width each and are from the same night. The volunteers need to answer whether a tail is present in one image, both images or is completely absent. What is the detection efficiency of Comet Hunters? How good is the project in detecting MBCs? What kind of MBCs are getting detected? This where my project comes in. My job is to create or simulate asteroid images similar to Subaru’s, with varying properties like the coma or tail strength, tail direction, etc. The volunteers’ choices for these images will help us characterize the kind of MBCs that are being detected by Comet Hunters. For example, we can find the minimum strength of the coma/tail for which the volunteers are able to spot them. Here are a two examples of images that I have generated till now. I will explain the process in the subsequent slides. Before I start talking about my work, I need to give some background information. I will be using this term called ETA to denote the strength of coma activity. As you can see, a value of 0 means absence of coma. If you look closely in the Subaru images, you will find that the asteroid image is elliptical not circular. I exaggerated the stretching in the model images I displayed in the previous slide. And you can also see this in on the image on left. Solar system objects move much faster in the plane of sky than the distant stars. And Subaru’s survey data images are usually taken for exposure times of 120-150 seconds, as they are not specifically designed for solar system observation. So during this interval the asteroids/comets move a couple of arcsec resulting in smearing or stretching of the image in the direction of motion. Here I present a simplified pipeline for the generation of model MBC images. As you can see, there are a lot of steps involved. Let’s go through them one at a time. The first part is the generation of a simple asteroid image with or without a coma, whose intensity strength we can control. Let’s see how a simple asteroid looks. Here is our asteroid, just a pixel wide, with no coma. So, all the pixels in this image have value zero except the central pixel which has the value 1.0. This is how the asteroid will look if we see it in space, without any optical or atmospheric effect. The ideal case. The image is 20 arcsec in width with a resolution of 0.01 arcsec per pixel (compared to Subaru’s resolution which is approx. 0.17 arcsec per pixel). So we see a tiny dot at the center which represents the asteroid. The coma is invisible in the default linear scale image. So I have also shown the log scale image to confirm the presence of a coma. Here are some images of asteroid with coma of different intensities. The ETA increases clockwise. Again, these images are all in log scale for clarity. So, we have our asteroid image with a coma around it. Let’s move on to the next stage. We now trail the asteroid. As I had mentioned earlier, trailing is necessary to account for the stretched asteroid image which is due to the significant movement of asteroid in sky during the telescope exposure time. The information we need to trail the asteroid is its speed and direction of movement as seen in the plane of the sky and the exposure time of the telescope, which will control the length of the trailed image. Here I trail an asteroid with coma of ETA value 25.0. We trail it with a speed of 50 arcsec/hour, at an angle of 45 degrees for an exposure time of 60 seconds. I have purposely shown the asteroid image in linear scale so that we can see the difference in the background intensity between the two images. Naturally, the comae from adjacent asteroids add up in the second image to make it look brighter. 1. We zoom into the central 1 arcsec region and now we can clearly see the individual asteroid replicas. 2. The gap between successive asteroids is because we are imaging in an interval of 0.5 seconds for the duration of exposure. Hence, the asteroid is displaced by the distance it moves in this small interval. Just a quick look at the trailed asteroid images for different coma intensities. All these images are of the central 1 arcsec region and are shown in logscale. OK. Now that we have the trailed asteroid, we proceed to a very important step: Reducing the resolution or increasing the pixel scale to Subaru’s. So in this step we go concert our high resolution images, of pixel scale 0.01 arcsec/pixel, to the lower Subaru resolution of 0.17 arcsec per pixel. But why did we start with a higher resolution? We are starting with how the image looks from space, before passing through the asteroid and being images by the CCD in the telescope. This is why we started with a single pixel wide asteroid, a point source. So, we are basically replicating how a CCD works, with all the photons falling in a square CCD pixel account for its value. Here’s a practical example: the famous Eagle nebula. Before we proceed, I would like to mention that prior to using this binning and summing technique to decrease resolution, we were trying to use interpolation. It didn’t work out at the end as we discovered a major flaw with the method or maybe the interpolation function we were using wasn’t working as expected. We can talk about this later if anyone’s interested. OK. So let’s see how the low resolution images of our trailed asteroid look. Here’s a high resolution trailed image that we saw before. The input parameters are also shown. As you can see, this one has ETA = 0 , ie , no coma. This is the low resolution image. It is 101 x 101 pixels wide. Please note that I have verified the total flux (in this case the sum of all pixel values) is conserved during the sum and bin process. 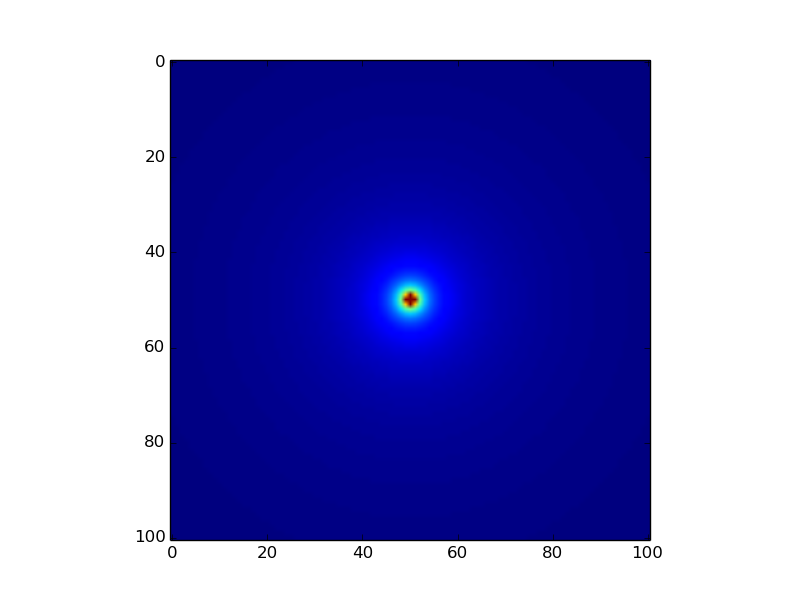 Here are some more low resolution image with same parameters as the previous image except ETA. OK. Let’s move on now to the final stage: convolving our model asteroid with a background star. But why do we need this? To account for two things that affect the ideal image: Atmosphere and Telescope optics. Convolving with a background star incorporates these effects into our ideal image and makes it looks realistic. 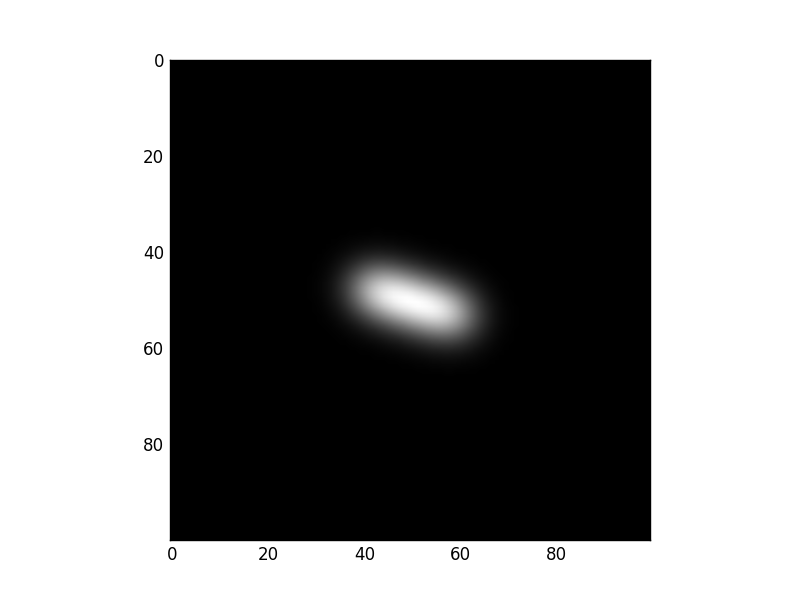 Here’s the background star which we will use for the convolution process. This was chosen by eye from a field image obtained from HSC database. You will notice that the image on the right here and many subsequent images are shown in zscale. This is because the Subaru images fed into the CometHunters website are in zscale. This scaling provides a convenient perspective to look for any activity in the object. Let’s see how our convolution process fares for some model images we have seen so far. Case 1: The most basic one: untrailed asteroid with no coma. As you see, since the model asteroid in this case is basically a delta function, the background star image is identically reproduced. Case 2: Horizontally trailed coma asteroid with no coma. Now here we encounter a major problem. The noisy background from the star’s image is getting trailed in the direction of asteroid’s movement. We have been trying to remedy this by playing with the convolution process but to no avail. Recently, we came up with a neat trick. Why not generate a trailed sky background image same as in the convolved output but without the central asteroid. Then, ideally, subtracting this trailed background with our convolved output should remove the background from the latter image, leaving just the asteroid part we are interested in. Let’s see how this works. Firstly, to generate the sky background we need to convolve our model asteroid with the background image (with star removed). We remove the star from the background image by simply replacing a central square region containing the star (the image on slide 31) with some random background sky region. This process is crude and not the best way to remove the star, but will have to work for now. You can see that the background sky gets trailed when convolved, as expected. Now we subtract our convolved output (from slide 33) with our trailed background image from the previous slide and…..Voila! The background gets removed perfectly! Now the final step is to add noise in this image. We add poisson noise to each pixel because of something called shot noise. Shot noise is caused by the random arrival of photons. This is a fundamental trait of light. Since each photon is an independent event, the arrival of any given photon at a pixel cannot be precisely predicted; instead the probability of its arrival in a given time period is governed by a Poisson distribution. Here you look at our final output image. Looks good, doesn’t it?! Although the pipeline is not completely ready to generate a the complete range of images of asteroids with tail, I quickly generated a basic asteroid with tail image – a pixel wide asteroid at center with a horizontal tail with intensity going of as 1/r – and fed it to the pipeline. The two images on the right depict asteroids with tails. Not bad, eh? The image on the left is the only recorded image in literature of a trailed asteroid with a tail – 107P/1949 W1. This is an old image, on photographic plate. On the right hand side I am showing you something similar that I tried to generate from my pipeline. The image on right hand side top is in a linear scale image while the one on the right bottom is the inverse color version, just like the 107P/1949 W1 image on left hand side. New HSC images are ready for review on Comet Hunters. These observations are from February 2016. These asteroid observations have never before been searched for cometary activity, and this is the first time human eyes have looked at them in such detail. As with new asteroids to review, there are new changes of finding a main-belt comet. Who knows what we’ll find! You might be the first person to spot a new comet. If any good comet candidates are found in these observations we can ask for telescope time to reimage these specific asteroids the next year to see if they are still active. These telescope proposals are due in the early Fall, so classifying these observations now has much value. We’re also prepping June/July 2016 observations to put on the site ASAP to be able to try and catch asteroids in the ‘act’, at the start of cometary behavior. The classifications from Comet Hunters will enable us to further explore the frequency of the Main-belt comet (MBCs), an important result. Its Ishan again, bringing you the updates of my work as a summer student at ASIAA,Taiwan. To recap quickly, I am working on creating simulated MBC images with variable attributes like the direction of motion, brightness of tail and coma, etc. My work till last week consisted of creating the coma around a one-pixel wide nucleus and trying to trail the image. I got a weird output and was trying to figure out what the problem was. By the way, in my previous post I forgot to mention the reason we are trailing the coma. Well, when we image astronomical objects using telescopes, we usually use a large exposure time in order to collect sufficient number of photons. This is about 150 sec for imaging asteroids. Now the asteroids move significantly faster on the plane of the sky than the background stars due to their proximity to earth and hence cover a distance of a few arcsec in this interval. Hence, we see a stretched out, elliptical object instead of a circular one. Coming back to my work, I’m glad to inform you that we figured out the issue! It was a pesky function I was using to shift the coma image to create the trailing effect (the function is ‘shift’ from the python module ‘scipy.ndimage.interpolation’). The function works as follows: It takes the image to be shifted and a 2D shift-vector as the arguments and shifts the image according to the shift-vector. It obtains the value of each pixel in the shifted image using interpolation. As it turns out, the default order of interpolation for this function is 3 which is unnecessary and the cause of all the trouble. Setting the order to 1 along with a shift vector having integer elements resolves the problem. Here is a trailed coma image with the corrected shift function. Looks better, doesn’t it? Note: The image looks very pixelated due to the low resolution. Interestingly, this very closely resembles the actual resolution of the Subaru Telescope’s Hyper Suprime Cam from which the actual images are taken. However, we still need to figure out a way to make the image smoother and minimize this pixelation. Onto the next challenge! We are a step closer to the final trailed image and I will be back with the updates next week! I am Ishan, a summer student at ASIAA, Taiwan. I started working with the Comet Hunters team, about 3 weeks ago, on creating simulated Main-Belt Comet (MBC) images. Using appropriate mathematical functions, we are trying to create asteroid images with variable attributes like the direction of motion, brightness of tail and coma, etc. When ready, these images will be fed into the Comet Hunters website intermixed with the real images. How the project as a whole performs on these images will help us gain better insight into how well Comet Hunters can find different strengths of cometary activity and thus the true number of main-belt comets. For example, we can figure out up to what minimum brightness level of the coma (with respect to the nucleus) of the asteroid do the volunteers generally detect it. For my present work, I am considering the nucleus to be just one pixel wide. For modelling the coma around it, we are using a 1/r profile centered around the nucleus. A sample coma is shown below. Note that the actual coma will be much fainter than the nucleus. As we can see, there is ‘cross’ visible at the center. This is due to the fact that we are plotting a circular function in square pixel-grid. Now when we trail this image in a randomly chosen direction, we get a weird output. As you can see, there is a skewed ‘X’ at the center of the trail. To check whether the trailing function is faulty, I fed it with a simple 2D gaussian coma. The resultant image looks pretty decent! We are currently trying to figure out the issue with the 1/r profile. Maybe using polar coordinates will resolve this. I will get back to you with the developments! Today we have the next post in our Meet the Comet Hunters Team series. This time we’re featuring Ishan Mishra who will be working on Comet Hunters this summer as part of the ASIAA Summer Student Program. What is your current position and where/institution? I recently graduated (May 2016) from the Indian Institute of Technology in Guwahati, India, with a major in Electronics and Communications Engineering. Where are you originally from/where did you grow up? I’m from India and grew up partly in the east Indian state of Jharkhand and partly in the west Indian state of Gujarat. What interested you in the ASIAA summer student program? During my first visit to Taiwan in 2015 (as a summer student at NCU), I attended an astrobiology seminar at ASIAA. I loved the institute and its people and hence applied to its summer student program. Having volunteered for some citizen science projects in the past, I feel the opportunity to know and be part of the behind-the-scenes work for Comet Hunters is just too cool! Why are you interested in main-belt comets? My primary field of interest is astrobiology and one of the greatest mysteries in the field is the origin of water on Earth. Main Belt Comets promise to be interesting tools to solve the problem. Name one hobby of yours? Listening to and playing music (on my guitar) from the Classic Rock/Rock n Roll era. What is the most recent tv show you have watched? What is the latest book you have read? Who is your favorite singer/band/musical artist? What are five of the top ten most played songs on your iTunes/spotify/etc playlist? What’s one thing most people don’t know about you? I share my birthday with Galileo. Today is Asteroid Day focusing on awareness of Near-Earth asteroids and promoting discussion about how to identify potential asteroid impacts and prevent them. You can learn more about the Asteroid Day and how it started here. On Comet Hunters, we ask for your help to identify main-belt comets (asteroids behaving like comets), so we decided to spend today answering your questions about asteroids, asteroid impacts, main-belt comets, and anything related to Comet Hunters. We’ve created a thread on Zooniverse Talk where you can post your burning questions, and we’ll be stopping by throughout the day to reply. See you Zooniverse Talk!